The vertical gardens for One Central Park’s high-rise towers were the result of months of meticulous research, testing, planning and design. They provide a tangible visual reminder to the public that the building’s development is committed to sustainable urban living. The scale of the gardens was unprecedented, and as of 2014, they are the tallest vertical gardens in the world. The walls are 150m high and the garden system consists of 23 panels that stretch over 1,000 square metres. The intricate hydroponic system that feeds the 35,000 plants on the facade is distributed from planter boxes at the base of the towers. Tensile Design & Construct was engaged to design and install the cable system that supports the gardens. A total of 15,000m of stainless steel cables and rods were required to span 34 floors and support more than 2,500 plants. Since a vertical garden hadn’t previously been installed to the proposed elevation, Tensile needed to determine the impact of wind on interactions between the structure and various plant species at a height of more than 110 metres. Prior to this, there was no information available that showed what forces are transferred through a plant when the wind hits it, and we understand that these are the first tests to have been conducted worldwide. Tensile spent a day in the wind tunnel conducting various tests and studies and measuring the results. We designed and built a custom rig that mimicked the design that the One Central Park building was to have. We also saw what would happen to the plants in a serious wind event, and were confident that a 1-in-100-year storm would not be the death of the climbers. As a result of our experiments, we are now able to accurately measure how much wind force passes through a plant and onto the cable, and thus the building structure. This allows for a much more efficient system design. These results changed our designs forever more, and we’re proud to say these have become the benchmark for green facade worldwide. 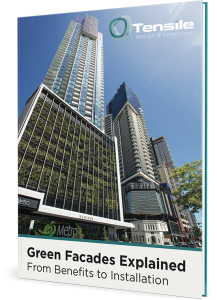 The implementation and success of the green façade is due to the hard work of Tensile, Junglefy, Aspect, Oculus and Andreasens. Whilst the final result may seem to effortless and easy, very few people realise the incredible amount of background work that went on to produce this incredible façade. Engineering issues that were encountered during the design were instigated by Tensile and Watpac verified the engineering data. While the health of vertical gardens is influenced by plant selection, the gardens also rely on mechanical systems to keep them supplied with water and nutrients. Advancing vertical garden, or “living wall,” technology to the scale of the One Central Park development called for a commitment to innovation from all specialists involved with the interacting components, both during installation and for maintenance afterwards. Opportunities to integrate systems were explored, while in some cases, simple solutions were derived from using existing materials differently. 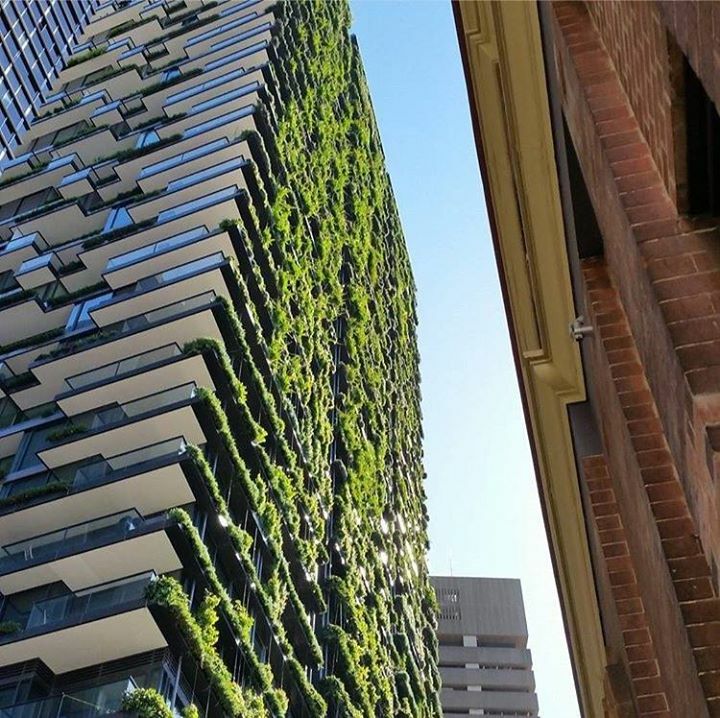 The painstaking attention to detail and collaboration between systems experts were rewarded with the successful installation and establishment of the vertical gardens, and the increasing recognition of their value as a visible symbol of green design. The gardens were cited for their contribution when One Central Park was named the best tall building in the world by the Council on Tall Buildings and Urban Habitat. We specialise in green wall systems and solutions. Take a look at more innovative projects here and contact us for more information.